is a relatively new dog breed and it was officially acknowledged in 1900. Although it was initially developed as a fierce guard and protection dog, the Doberman‘s temper was greatly attenuated, and it has become a loving and devoted, yet protective dog. At the end of the 1800s, in Thueringen, Germany, Louis Dobermann was attempting to develop the perfect guard dog. Even though the sources of development often generate controversy, many people believe that the Rottweiler, the German Pinscher with smooth hair and the brown and black terrier contributed to the development of this breed. The Doberman was born in 1890 and the breed was officially acknowledged in 1900. Soon after, the breed was imported to the United States. In 1921 the Doberman Pinscher American Club was founded, and shortly the breed became very popular as an utility breed. The Doberman suggests nobility and elegance. This medium sized dog is compact and well proportioned. Its hair is short, colored in black and rusty, black and brown or dark red and rusty. The new color varieties are brown with lighter spots (Isabella variety) and blue with lighter spots. The Doberman‘s head has a conic shape, and its ears can be cropped or not. Uncropped ears are naturally saggy. Its tail is amputated. The male’s height at the wither is 66-71 cm, and the female’s height is 61-66 cm. The body mass of both sexes is 30-40 kg. 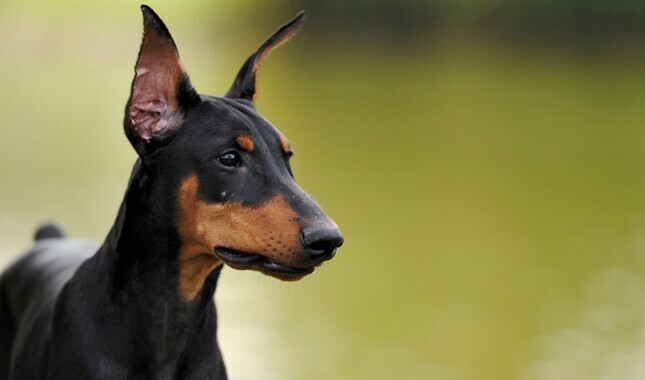 The Doberman Pinscher was developed as a guard dog, as well as a company dog. The first Dobermans were much more aggressive than today’s specimens. Nowadays, the Doberman is much friendlier, but it remains an excellent guard and protection dog. If properly socialized, the Doberman is loving and loyal and will give its last breath to defend its master. The Doberman is a type of dog who loves human company, but it is not the most appropriate breed for families with small children. Despite the fact that it is a loyal and protective dog, if not raised or educated properly, the breed ca become mean, disobedient and even aggressive. The Doberman is an intelligent dog, but it can also be intimidating and thus it is not the most suitable breed for first-time dog owners. The Doberman is prone to colds, which is why they must be kept indoors during chilly nights. As strange as it may seem, the Doberman is an excellent dog for people who live in flat buildings. Training: The Doberman excels in obedience training, but due to a certain degree of independence, it requires firm and consistent guidance. Because they are fast learners, the specimens of this breed are used as guide dogs for the blind and the deaf. The Doberman‘s popularity has led to an inappropriate breeding. This generated an aggressive behavior in some specimens. Make sure you get your Doberman from a well-known breeder. Wobbler’s Syndrome is a malformation of the neck bones which causes pain and affects the dog‘s gait (lack of stability in movement). Gastric torsion (dilation) is a sudden condition that endangers the dog’s life and it is associated with the stomach being filled with air and torsioned. Hip dysplasia is a malformation of the coxo-femoral joint which results in pain and limping, followed by arthritis. Cardiac dilation is a heart condition that results in the enlargement and thinning of the cardiac muscle which forms the heart walls. Hypothyroidism occurs when the thyroid does not work properly. This condition may develop if the amount of thyroid hormones is insufficient. Alopecia is a condition which causes the dog to lose its hair. Cataracts causes the eye lens to lose its normal transparency. This condition may affect one or both eyes and, in time, it may lead to sight loss. Diabetes is a pancreatic diseases associated with insufficient insulin production. 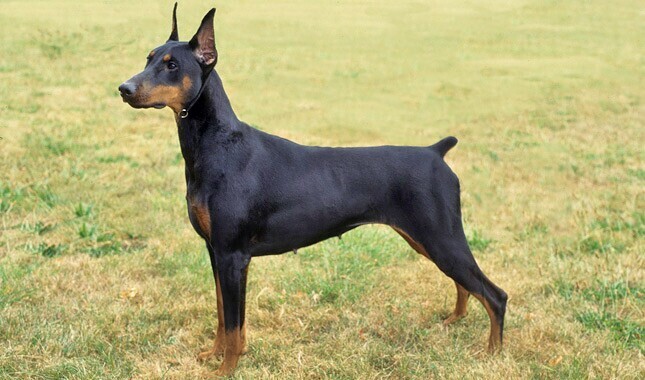 Moreover, the Doberman is prone to von Willebrand disease, acne, osteosarcoma and elbow dysplasia. The average life expectancy of the Doberman Pinscher is 12-15 years.